A talented but arrogant ballroom dancer finds himself without a partner and shunned by the stifling rule makers when he dares to dance his own imaginative new steps while competing. Forming an unlikely team with a left footed amateur dancer, the mismatched pair set out to change the sequin clad world of ballroom dance forever. 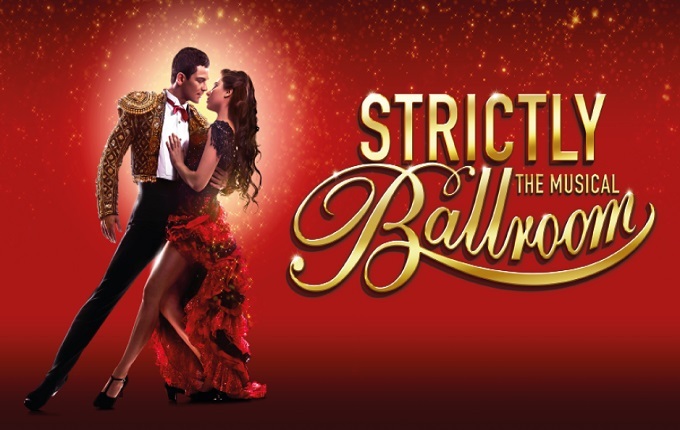 Strictly Ballroom the musical is based on the cult classic film that opened Baz Luhrmann’s iconic Red Curtain trilogy and introduced the flamboyant director to global audiences. Preserving all of the visual charm and musical magic of the big screen version, this new musical is an absolute delight, transferring the all the film’s most iconic characters and moments effortlessly to stage. From its opening moments this production sweeps audiences away in a tsunami of sequin soaked charm. Oscar winning costume designer Catherine Martin has recreated all the iconic style and camp glamour of the original film production. Every moment on stage drips with glitter and an unashamed explosion of colour. The shows dance numbers are a twirling rainbow of extravagant ruffles, slick cat suits and comically bouffant hair. There is an undisputed charm to the show’s ostentatious silliness. It’s simply impossible not to be won over by the look and feel of a world that is so uniquely fancy and fun. Of course music is essential for dancing and this musical boasts all of the iconic songs that made the original film such a memorable pleasure. Will Young does a simply magnificent job breathing life into each classic track. His renditions of songs such as Love Is In The Air are breathtakingly brilliant. Backed by a skilful live band he is a reliable one man jukebox. His performance as the moustachioed compare leading audiences through the story with gentle narration is equally accomplished and welcomed. The shows two leads are both equally sensational in demanding roles that require emotional range and dancing perfection in equal measure. Jonny Lambe is a perfect fit for Scott Hastings, the fleet footed wannabe dance champion with undeniable natural charisma but a self-destructive chip on his shoulder. Likewise Zizi Strallen is amazing as Fran, the dowdy and downtrodden dance studio lackey finally stepping out of the shadows and into a transformative spotlight. It’s impossible to heap enough deserved praise on both these relentlessly talented performers. Their abundant chemistry and dramatic evolutions gives the production heart and subtly beneath all its glitzy ballroom diva antics. A stellar supporting cast also add plenty of laughs along the way, making this show the near perfect combination of everything people hope for from West End entertainment. While there’s little negative that can possibly be said about this truly five star production, obviously the shows flamboyant kitsch visuals and unashamed dancing passion won’t appeal as much to those that hastily reach for the remote to change the channel whenever Strictly Come Dancing comes on TV. For everyone else with a less sullen and cynical demeanour, this show remains sensational fun. Audiences will fall helplessly in love with this audaciously wonderful new addition to the West End. Fans of the original film and newcomers alike will be caught up in a magical world of sequins, song, love, laughter and dance. An astonishingly brilliant cast, iconic songs and charmingly camp visuals make this a truly five star night of theatre magic.